The dentists at River Dental in Medicine Hat, Alberta can use dental implants to replace your missing teeth, so you will not have to worry about unsightly gaps in your smile again. Dental implants can be used as a single tooth replacement for missing teeth, fill the gaps in your smile, or provide denture stability and support. Depending on each patient's case, we offer a variety of dental implant options that can be tailored to your needs. Bone will shrink away as a result of not having a tooth in the area for a long period. Should this be the case, and implants are needed or desired in the area, then bone augmentation may be necessary. There are many types of products used for augmentation. Today the most common involve using donor, bovine or man made products that stimulate bone growth in the patient’s mouth. These product are have been used in the medical and dental field for many years with strict guide lines for safety and efficacy. Some of the new techniques like the All-on-4 were designed for patients who had minimal bone and did not want to undergo involved grafting, for example: of the upper jaw sinus. To find out if you are a candidate for dental implants, first you'll have to book a consultation at our office. This involves a brief exam and usually a 3D radiography to measure the volume of bone. A River Dental dentist can help answer your questions and guide you in determining your treatment options. 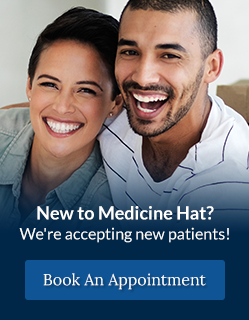 Contact our Medicine Hat office today.